Most fans of The Flash expected that Eobard Thawne, a.k.a. Reverse Flash, would be defeated in the Season 1 finale, but few likely anticipated just how he would be taken out. Instead of Barry Allen being responsible, it was Thawne’s ancestor Eddie that turned the tables by killing himself, thus wiping out his future family line and making sure Eobard never existed. It was a shocking moment for faithful viewers, and as it turns out, the cast was just as surprised by the turn of events. I don’t think people foresaw Eddie turning a gun on himself to wipe out all his descendants, including Eobard Thawne, and thus save the day. I remember when Grant Gustin, who plays Barry, read it, and he was like, “Dude!” But yeah [it was] good. Nice little twist. Eddie’s death was set into motion following Eobard’s capture in “Rogue Air.” The future speedster told Barry that he could save his mother if he opened a temporal portal, which would also allow Eobard to return to his own time. While the team was prepping for Barry’s mission through time, Eddie was depressed about what Eobard told him about his future in “Grodd Lives.” However, his attitude changed when Dr. Martin Stein noted that the young detective is an anomaly, which allowed him to make his future whatever he wanted it to be. It was this wild card status that led Eddie to make his fateful decision. Everything was going swimmingly for Eobard until Barry came back through the portal (having not altered the timeline by saving his mother) and destroyed his arch-nemesis’ time machine. Understandably enraged, Eobard proceeded to kick Barry around and threaten to kill everyone he loves until Eddie turned a gun on himself. 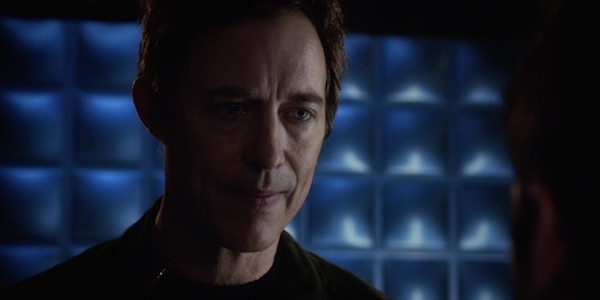 By doing this, he ensured that Eobard would never be born, but at the cost of his own life. So it’s no wonder Grant Gustin and the rest of the cast (not to mention the fans) reacted the way they did. Despite Eobard Thawne’s erasure, Cavanagh will remain a main cast member during The Flash Season 2 as a Harrison Wells from another universe. Executive producer Andrew Kriesberg also mentioned shortly after the Season 1 finale that he hopes Matt Letscher, who played Eobard in his original form, can continue to be a part of the show in the future. As for Eddie Thawne, it’s the same deal with Wells. As long as there are parallel universes and alternate timelines, there’s always the possibility Eddie will be seen again. Plus, don’t forget his body was sucked into the temporal singularity. Who knows what kind of sci-fi twist the show could accomplish with that? Nearly five months after this game-changing episode, The Flash Season 2 will premiere next Tuesday at 8 p.m. EST on The CW.